Wondering what’s on the menu for the year ahead? 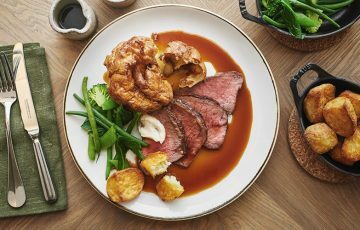 We’ve trawled the trend reports and hand-picked some of the top food trends for 2019. If you’re into ice-cream and ugly veg, this could be your year! Alcohol-free drinks at Rivington Greenwich. 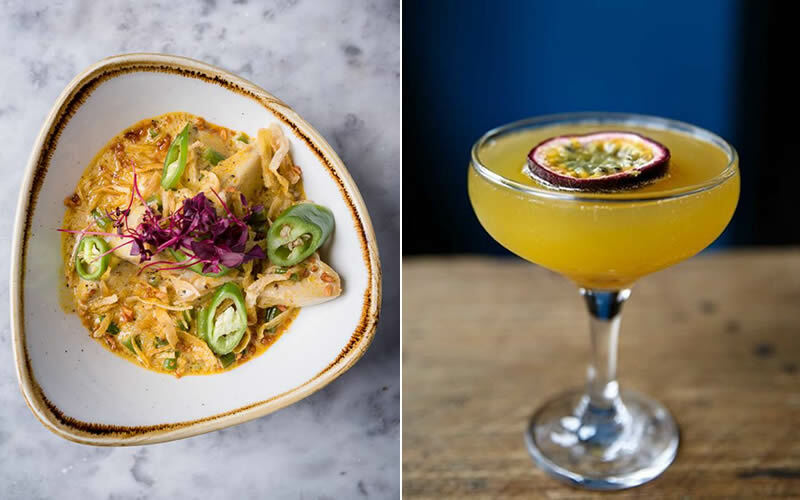 Low booze, no booze – With more us choosing to cut back on booze or ditch it completely, we’ll see an increase in low-alcohol drinks on menus this year, as well as interesting soft options like infusions and craft sodas. Sales of low- and no-alcohol beer is on the rise, along with non-alcoholic spirits like Seedlip. 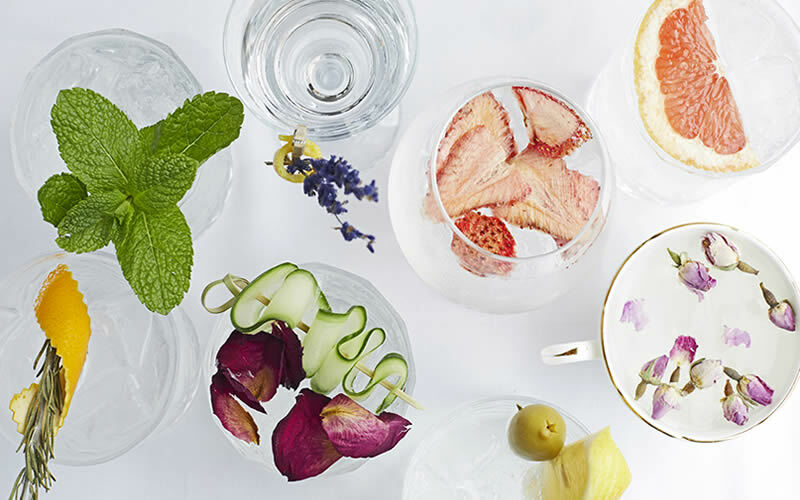 It’s a chance for bartenders to get creative and experimenting with savoury cocktails and drinks made with kombucha, fruit and veg trimmings, and aquafaba, according to Waitrose. Mushrooms – Packed with nutrients and high in antioxidants, the humble ‘shroom has shot to superfood stardom in recent months. They’re cropping up in everything from coffee and chocolate bars to beauty products and burgers. Expect to see more of them on menus this year as restaurants find new ways to showcase them – think confit, pickled, and even cocktails. Oat milk – Move over almond milk, oat milk is our new dairy-free fave. It’s creamy and froths up like the real deal – perfect for smoothies, coffee and cereal. The ice-cream revolution – Ice-cream is having a moment, according to Waitrose and Whole Foods. Forget vanilla, now’s the time to try frozen treats made with avocado, hummus, tahini, and coconut water. 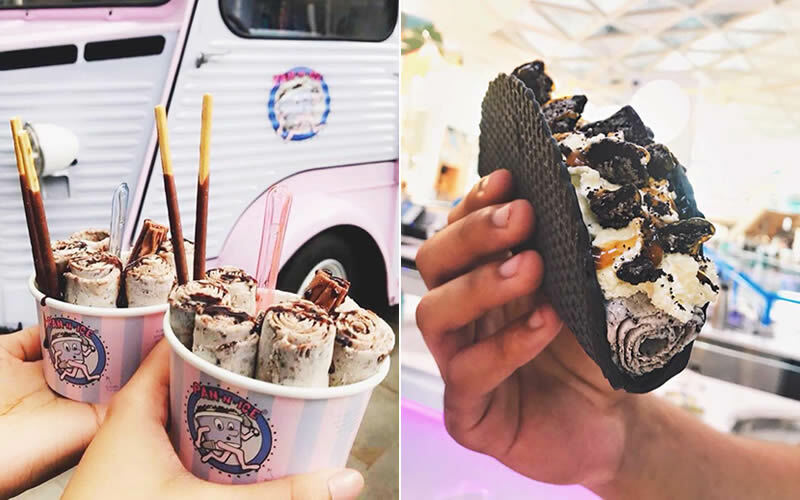 We’re not sure about ice-creams with ‘savoury swirls of artisan cheese’, but we’re open to boozy gelato, Taiwanese shaved ice, and ice-cream tacos. Farewell to plastic – Expect to see lots more businesses going plastic-free wherever possible this year. If you’re used to sipping through a straw, keep an eco-friendly alternative in your bag. Ugly veg – With the plant-based revolution showing no signs of slowing down, it’s time to embrace previously neglected ‘ugly veg’ like turnips, celeriac, Jerusalem artichokes, and salsify. Great British Chefs also suggests making use of the bits we often throw away, such as broccoli and cauliflower stalks and leaves. 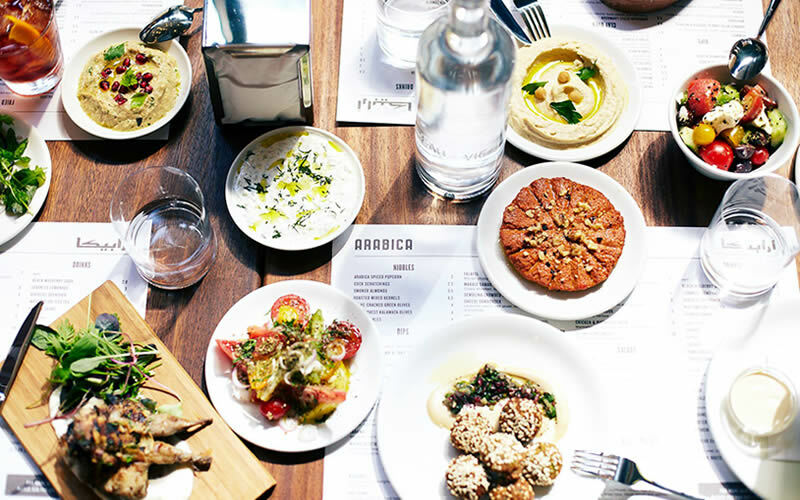 Middle Eastern dishes at Arabica Bar & Kitchen. 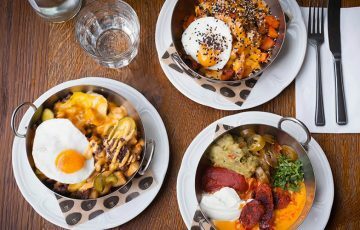 Middle Eastern spices – Look out for restaurants experimenting with spicy harissa, citrussy sumac, and fragrant za’atar as our love affair with Middle Eastern flavours continues. Beyond seaweed – We’ve already embraced seaweed snacks and salads, so is 2019 the year we tuck into algae and kelp? Whole Foods are predicting a rise in ‘ocean flavours’ – kelp jerky, puffed snacks made from water lily seeds, and crispy salmon skin. Jackfruit stew at Romulo Café / Passion fruit mimosa at The Spread Eagle. Pacific Rim flavours – “Flavour inspiration from the Pacific Rim (think Asia, Oceania and the western coasts of North and South America) are popping up in grocery stores and restaurants as people continue to explore more of the world through their palates,” says Whole Foods. They’re predicting a rise in ingredients like jackfruit, shrimp paste, and longanisa (Filipino sausage), as well as tropical fruits like guava, passion fruit, and dragon fruit. 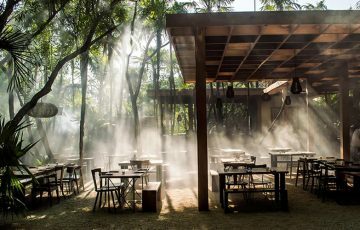 Best of the rest: Plant-based everything, hemp, faux meat, pies, West African food, CBD-infused food and drink, Georgian cuisine, unplugged (phone-free) dining. Sources: Whole Foods. New York Times. Waitrose. Self. Great British Chefs. Pinterest.